Years and years ago I decided I would make something tasty as holiday gifts for the teachers I worked with. I knew everyone loved chocolate and wanted to experiment with something different. 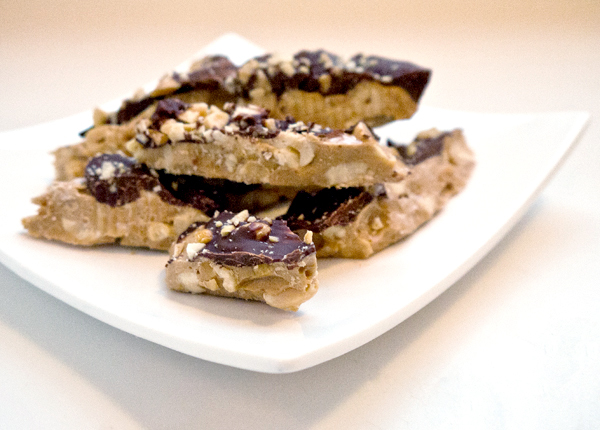 When I came across a recipe for chocolate peanut toffee in Gourmet, I was smitten. The combination of salty nuts, crunchy toffee, and melted chocolate sounded divine. And the recipe boasted making a big batch, meaning I’d have enough for treating my fellow teachers and still have some leftover to send with the husband for holiday giving at his work. And the ingredients needed for making this delicious toffee cost around $5 — especially if you hit up the dollar store. Over time I’ve adjusted the recipe and found the perfect combination that makes one of the best crunchy chocolaty and nutty toffee around. I look forward to making it every year (and know people look forward to receiving it too). 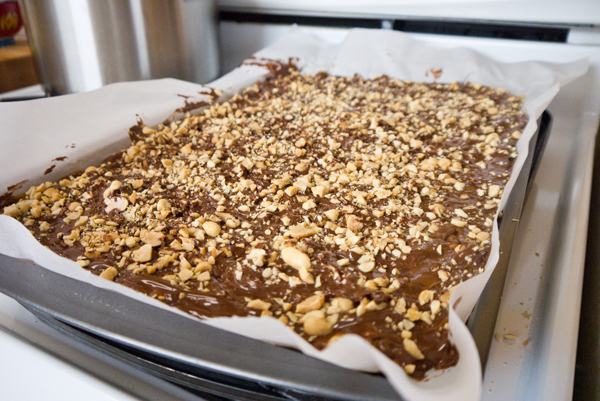 This is a recipe that will make your friends and family thankful for this toffee treat. I definitely splurge for organic ingredients, which does add a few dollars to the final deliciousness, but it’s totally worth it. 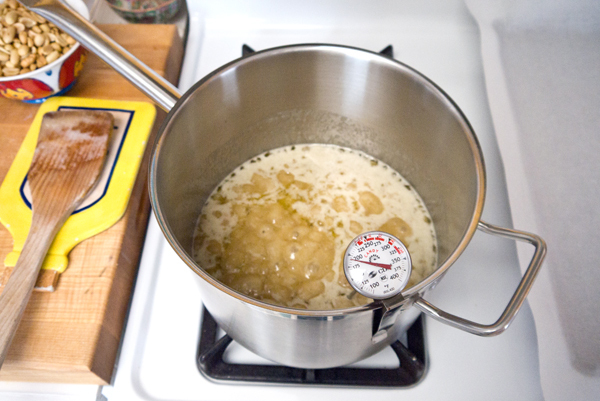 Place the butter and sugar in a large stockpot over medium heat and wait for the butter to melt. You want the butter and sugar to turn a rich honey brown and register around 300 ˚F on the candy thermometer (which you need!) before the next step, which can take around 15 minutes of babysitting. Candy making takes patience — and just the right temperature. Even though I’ve been busting this toffee out for the last five years, last year I attempted one batch without a thermometer, and it was a sad disaster. While you’re waiting for the butter and sugar to boil, line a 11 by 17-inch baking sheet with parchment paper. Once it starts simmering, whisk the mixture to incorporate the butter and sugar. 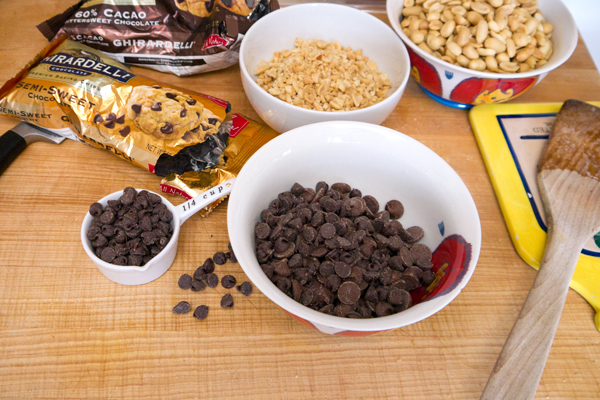 Chop one cup of nuts for topping your toffee and measure the chocolate chips so everything is ready when the toffee is. I’ve found using a low-salt peanut creates a seriously sweet and savory toffee, instead of one that’s bombarded with over-salted nuts. I pick mine up at Trader Joe’s. 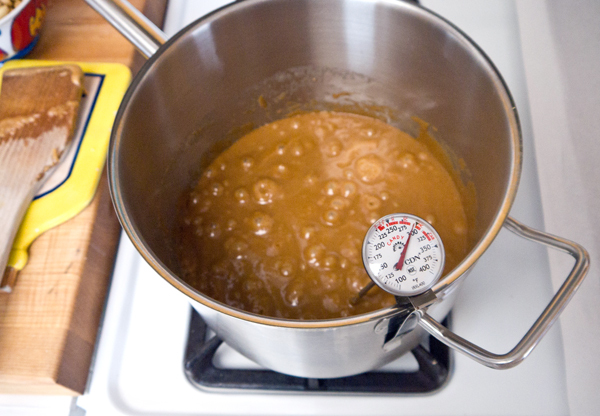 Once your toffee hits 300 F, turn off the heat, remove the candy thermometer and add the three cups of nuts. Give the mixture a stir and then add the vanilla and dash of cinnamon. 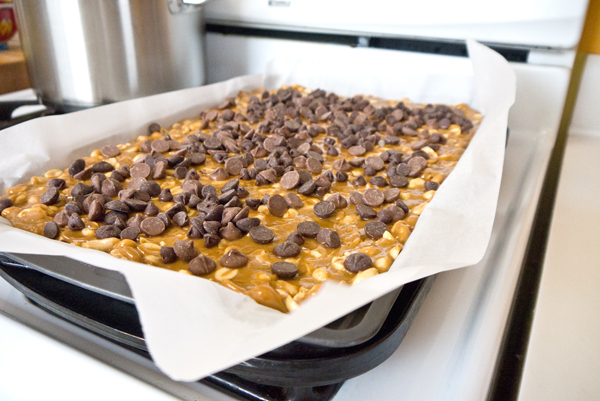 Spread the peanut toffee in the parchment covered sheet pan creating a nice and even layer of goodness. Now sprinkle the chocolate chips over the top and let sit for a few minutes until the chocolate melts. Use a knife to spread the chocolate over the toffee and then sprinkle with the chopped nuts and a light dusting of sea salt. 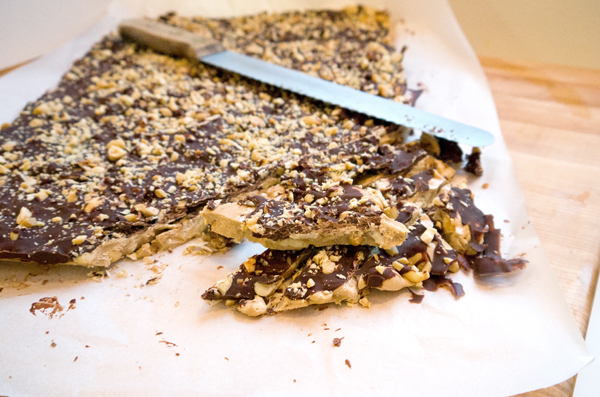 Pop in the fridge for an hour and then use a large serrated knife to cut the brick of toffee into pieces. Place in decorative bags and you’re ready for holiday gift giving. Why does my toffee separate upon reaching the 300 degrees leaving me with a mess of oil that needs to be drained off from the toffee? I love the idea of using macadamia nuts, Victor! I’ll add the sheet pan size to the recipe – thanks for the suggestion! Mine measures 11 by 17.